A primary reason for this dissatisfaction is that traditional Enterprise Content Management (ECM) technologies are purchased and deployed to control business content, while most workers need to share content. Employees need to share content both with colleagues thoughout the organization and, increasingly, with others not directly employed by their company. However, traditional ECM technologies make it hard to share content within a single business and, in many cases, impossible to do so between organizations. 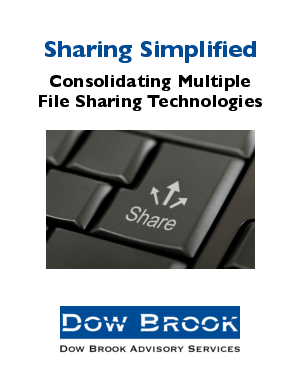 Ideally, multiple file sharing technologies would be consolidated into a single solution that is intuitive, yet scaleable, reliable, secure and affordable. Read how one company's continuing consolidation of file sharing technologies reaped benefits that any organization may derive by undertaking that effort.